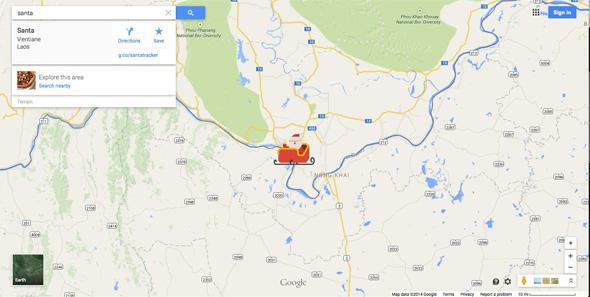 Google has a Santa Tracker and Microsoft worked on one with Norad. Christmas eve is really going digital this year. Whether you think Santa is a big white guy or a penguin wearing a fake beard, you can get your fill of the flying sleigh from a few different trackers. Google’s offering, which you can access by searching “santa” on Google or Google Maps, includes route information, a latitude and longitude game, a present counter, and “sleigh selfies.” Santa looks jovial in his sleigh, but Google doesn’t show any reindeer pulling it, so the (magical) propulsion method is kind of unclear. Meanwhile, the North American Aerospace Defense Command (NORAD), which has a long history of mapping Santa’s movements, partnered with Microsoft to make its service this year. The tracker features both 2D and 3D views of Santa, the sleigh, and all nine reindeer, plus a counter of how many gifts have been delivered on the route, and information about last and next stop. The tracker also includes prominent Internet Explorer branding no matter what browser you’re viewing it on. Both NORAD and Google also released apps for following Santa on mobile devices. Google’s is Android-only and NORAD has options for Android, iOS, and, of course, Windows Phone. If you want a third option, there’s TrackingSanta.net, which has been online in various forms since 1994, and is run as a collaboration between santaupdate.com, Kringle Radio, and mymerrychristmas.com. Since none of this is, you know, real, the trackers don’t sync up in terms of placing Santa in the same place at any given time. It’s a rare moment on the Web where there’s no such thing as bad information.